Feature this TV console and storage hutch in your living room for an entertainment wall unit with cubicle storage. 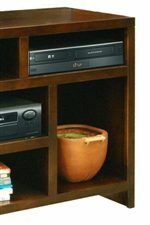 Shelves on the hutch are ideal for categorizing DVDs and blu-rays, or for showcasing an abbreviated library of your favorite texts. The console base offers a support for your TV and a combination of closed storage for personal items and open storage for electronics. The Urban Loft 84" TV Super Console and Hutch by Legends Furniture at Sparks HomeStore & Home Furnishings Direct in the Thatcher, Cottonwood, Safford, Sedona, Morenci, Arizona area. Product availability may vary. Contact us for the most current availability on this product. The Urban Loft collection is a great option if you are looking for Casual furniture in the Thatcher, Cottonwood, Safford, Sedona, Morenci, Arizona area. Browse other items in the Urban Loft collection from Sparks HomeStore & Home Furnishings Direct in the Thatcher, Cottonwood, Safford, Sedona, Morenci, Arizona area.